Hunter Killer, the new submarine thriller from producer and star Gerard Butler, examines a fictional international conflict from many different angles. 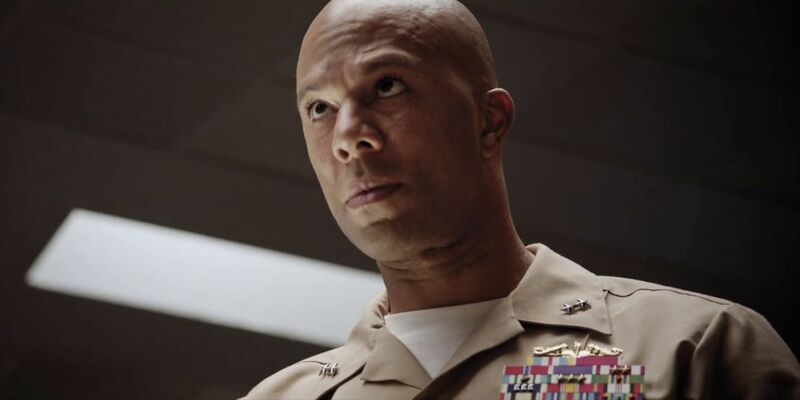 For one, Butler plays a Navy captain on a submarine, navigating dangerous waters and launching torpedoes at enemy subs. Meanwhile, Toby Stephens leads a crack squad of black ops soldiers as they engage in high-tension, boots-on-the-ground action. Finally, Common, Gary Oldman, and Linda Cardellini play off each other from the relative safety of The Pentagon, watching the action unfold from afar and dealing with the bureaucracy of a prospective world war. Tell me about acting in an action movie, but not in an action role. I approach each and every character that I’m blessed to play with, with as much passion as possible, with as much research and preparation – I prepare the way I would for any character. Even if I was playing just an action role, where a majority of the work was in action, I still would have to build who this person is. Because, I believe that when you are watching a film, you just want to let go, and just see these people live and see what the story is. I think it denotes me having to put in that work, whether I’m in a fighting scene or it’s a very dramatic scene. It was fun just to sit back and maybe not have to do the training, but I actually really really love getting to do certain fighting scenes and action characters, so… It was fun. It was great to work with Gary Oldman, also. You and he have some great… They’re like fight scenes, because he’s screaming at you, and you’re just standing there, barrel-chested, and taking it in and being so stoic and not screaming back. Tell me about getting into character for scenes like that. I think, when you’re part of the Navy, part of an organization that has ranking and you have to take orders, there’s times where you have to listen, and you have to listen to your superior officer, and you may not agree with everything he’s saying, but you have to take it in, and then you also have to rationally say what your perspective is. I think that’s where Fisk, my character, came from. He was somebody who knew that he is a leader himself, but he also, to be a leader, you have to listen. It was important that that quality was there, in Fisk. I think anybody who is at that ranking, that level, of an officer, you’ve gotta take it sometimes. You’ve gotta take the cuss-downs and all that, you’ve gotta take it, so… It was good. Gary Oldman, as an actor, puts you right where you need to be in the scene, so that allows me, with all the work I do, to just be present. I really enjoyed the experience, and learned, too. Another actor you work with a lot in this film is Linda Cardellini. Tell me about working with her and putting your scenes together. She was just really fun, to be honest. We had a lot of time behind the scenes, talking about everything in life, and joking, and just talking about aspirations. As much as our characters didn’t have a real connection, we felt like we were on opposite sides, it helped- it always helps when you get a chance to really connect with the actors and the artists and everybody that you’re collaborating with. It brings that much more energy to it. You feel free to try things when you feel comfortable with the person. And also, it’s just… When we’re all on the same wavelength and we’re sharing the same vision, it creates a better product, a better film, a better story. It helped us, even in the friction of our relationship in the story. Last question. This is a big action movie, but it has such great messages about cooperation and compassion. What do you want people to take away after they see Hunter Killer? I would like for people to enjoy it and have a sense of love for themselves and community in a way… Like, if you’re part of an organization, know that it takes you to be empowered yourself, but also know that you’re part of a bigger story. And within that story, you want to help collaborate and support that vision. I hope that message is given. But more than anything, honestly, this is a movie that people can leave and just feel like, “I enjoyed this movie!” There is some drama and tension in it, with some good action, and… I haven’t seen a good sub movie in a minute!